When this Pokémon card was first released, I have to admit I was not too high on it. I just did not like how in order for it to be effective, one of your Pokémon had to be knocked out. Otherwise it would only yield you a less than modest 4 card hand. A 4 card hand is fairly weak unless you have a Claydol out already. In those 4 cards, you may draw a couple Pokémon or energy which you will play down immediately. If you do not draw another supporter or draw card in those 4 cards, you will be stuck with a 2 to 3 card hand and become reliant on a topdeck. However, I now feel that this card is reasonably strong at the moment. With the advent of fast decks such as Beedrill, Machamp, and Luxray/Infernape, your Pokémon are going to be KO’d quickly and often. It is necessary to have some sort of recover against those decks, and this card is perfect for that. If you can get a brand new 8 card hand early in the game, it will significantly increase your chances of making a comeback. Besides being effective versus speed decks, it can also be incredible helpful versus power locking decks. Any deck that plays Mesprit LA or Power Spray will be difficult to deal with when you are reliant on Claydol’s “Cosmic Power” for drawing cards. A deck using Palkia G Lv. X will try to shut off your powers for several turns in a row. Without the ability to use Claydol, they have a great opportunity to simply take over the game. If you fall behind against a deck like that, it is hard to come back. Cynthia’s Feelings is great against a deck like this because it gives you a chance to keep up with them. If you can get a new 8 card hand while they are trying to power lock you, that can basically nullify their strategy and keep you in the game. I would recommend playing in the neighborhood of 3 copies of this card in most decks. It reminds me a bit of the card Copycat which I used to play 3 of in nearly every deck. If you have any thoughts about this card, please comment! We want to hear from you. This card seemed great way back when in kingdra, also in AMU. 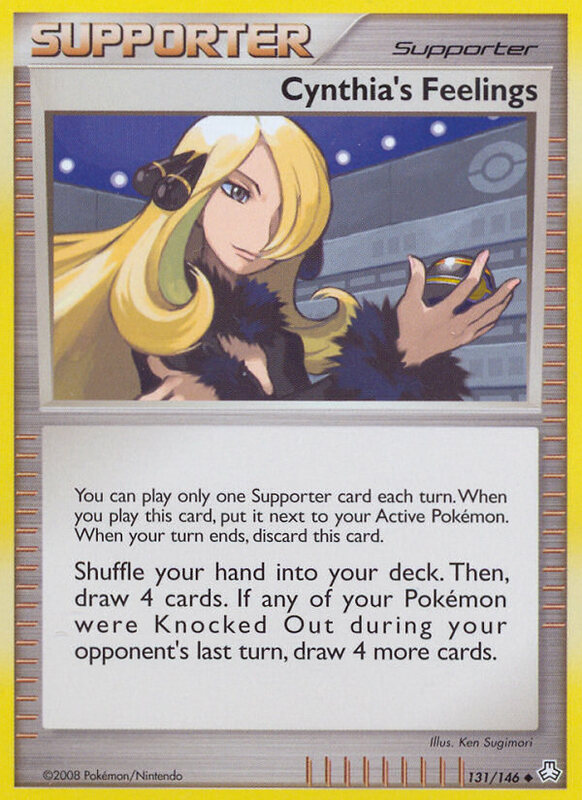 I think that cynthia is great in flygon and maybe even decks coming out in supreme victors. I use at least one in every SP deck I run because usually you should be able to notice when your opponent is about to KO and you can grab it with Cyrus! That’s a superb idea Rokman, I gotta try that out. If you don’t have any Claydols, or only have one, Cynthia is an excellent alternative or supplement. 4 Cynthias and 4 Professor Rowans in a deck give pretty good draw power. You will almost always have at least one in your hand. Even if you need to give up a card or two when you play it, the cards you give up are still going back into your hand, so you can get them again later in the game(hopefully). I run 2 in beedrill, and try to run at least 1 in every deck I play. It is definately underrated and overlooked because most of the time it doesn’t do a whole lot. But netting 8 fresh cards is game braking. It reminds me alot of holon scientist, which was bashed alot but a tech 1 won me so many games, and not playing 1 cost me quite a few back in the day. Same type of deal to me. If your claydol gets smoked, running this in a BTS deck can get you that other dol back down instnatly, instead of scooping your cards up. This is the one card in all of my decks that I will NEVER cut. Luxury Ball is more likely to go than Cynthia’s. This one card creates way too much recovery in a tight spot. It is also incredible defense against Power Sprays which I don’t think I mentioned. Jeremy and I were testing today and Cynthia’s bailed me out so hard when he would Spray my Claydols. It’s great to just hold it in your hand waiting for them to go for a KO directly followed by a Power Spray in efforts to bind you down. Yes. If there is an issue in a lot of decks these days, it is the lack of non-power related draw support. Taking out Cynthia’s really kills you against Power Lock. I think this has some nice potential even without the boost from a knockout. Say you have a bad hand, use this refresh it to four cards, play anything you can, and use Claydol to increase your low hand size. You might have really a attention individual posting design and offer you great details. The content articles are wonderful to study and you don´t use ton of ads like all of the other bloggers. Hi. I genuinely liked reading by means of your current post!. High-quality substance. I would undoubtedly advise you to occur up with articles a bit much more frequently. By doing this, having this kind of a useful website I really feel you may rank higher in the search engines . I also subscribed to your Rss. Continue the excellent job! What I do not comprehend is how you’re not even far more famous than you’re now. You are just so intelligent. You know so much about this theme, made me think about it from so many diverse sides. Its like folks arent involved unless it has some thing to do with Lady gaga! Your stuffs fantastic. Keep writing! Hi buddy, your blog’s model is easy and clean and i like it. Your blog content are superb. Please hold them coming. Greets!!! I was searching for some information & got your blog. I just loved it. Keep up the good work. You sure do know what youre talking about. Man, this blog is just fantastic! I cant wait to study more of what youve got to express. Im genuinely happy that I came across this when I did due to the fact I was actually starting to acquire bored while using whole blogging scene. Youve turned me close to, man! This wordpress theme you’re running, is it custom or did you download it form one of the free theme sites? I recently saw a little mini serious about this on uh…CNN? Maybe it was Fox? Don’t remember exactly which station but someone was running a special on it.